Galleri Thomassen is pleased to present the Finnish artists Hannaleena Heiska, Rauha Mäkilä och Camilla Vuorenmaa in the exhibition In the Belly of Painting. 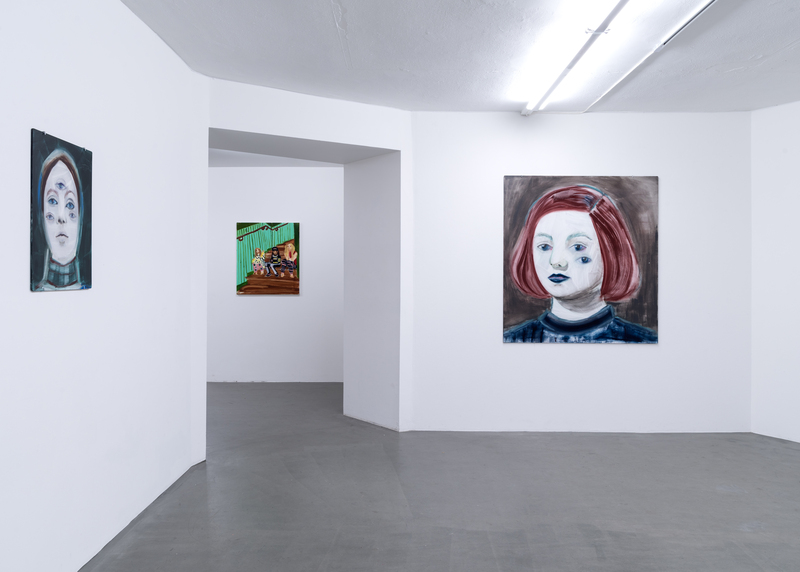 In the Belly of Painting will feature recent paintings by Heiska, Mäkilä and Vuorenmaa. The artists have included other media beyond painting in their practice before, but this time they have all decided to focus solely on painting. Through their ongoing dialogue and during studio visits the title of the exhibition emerged. All three artists are connected by an urge to find the essence in painting, that thing that you feel deep in your stomach, in your belly, your gut. 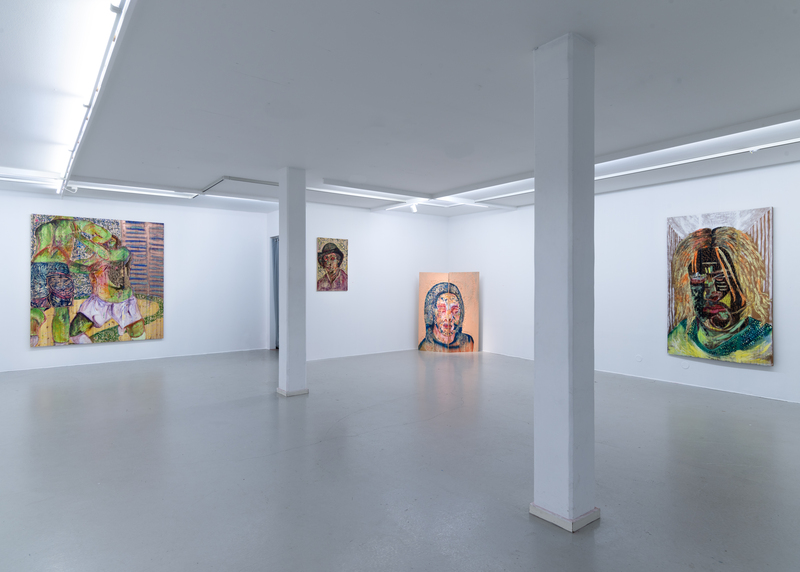 Hannaleena Heiska’s works have most recently been seen in Gothenburg in her solo exhibition at Göteborgs konstmuseum in 2015. Earlier in 2017 they were all part of the exhibition Sensual Knowledge, curated by Mika Hannula, at Landskrona museum. Hannaleena Heiska’s new paintings play with the interaction of abstract and figurative. Associations of crystal caves and the subconscious arise. The splintered and fragmented landscapes and the light that punctures those spaces create an experience that feeds our imaginations. The figurative paintings have a psychological tension that is hard to put to words. Heiska has recently been exploring questions of multiverses, artificial intelligence, the future and possibility of life after death in her artistic practice. Rauha Mäkilä is interested in how clumsiness, beauty and the ugly meet in the painterly trace and on the canvas. How colors interact and how her own attitude towards different painting techniques results in a variety of gestures. The artist is well known for her depiction of popular culture and youth, being both fun and cool and profoundly sincere at the same time. The artist has always explored her own experiences of the surrounding world in her paintings and thus making her daily life one of her subject matters. Camilla Vuorenmaa presents a series of portraits that have been executed with a combination of painting and carving. For Vuorenmaa carving resembles drawing and the line is very important in her work. In the new paintings the expression of the people she has depicted is introvert, but the state of mind of the person in the picture is manifested in colors and patterns on the face, clothes and background. Harjoitus 1. presents a training session of two wrestlers which can be seen as a metaphor of a human relationship. Hannaleena Heiska (b. 1973, Oulu) graduated from the Department of Painting at the Finnish Academy of Fine Arts in 2006. She was one of the artists nominated for the Ars Fennica, in 2011. 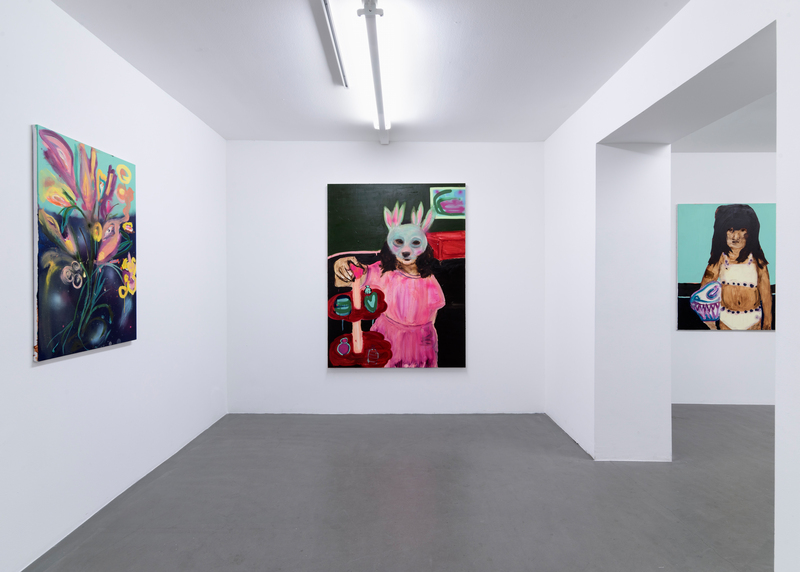 Heiska has exhibited internationally, for example, at Göteborgs konsthall, Gothenburg, 2015; Espace Louis Vuitton Gallery, Tokyo 2012; and the Beijing Biennale 2010. In the autumn of 2017 she participates in Ural Industrial Biennale in Ekaterinburg, Russia. Heiska’s works are represented in many significant public collections, such as Gothenburg Museum of Art, Museum of Contemporary Art Kiasma, Helsinki, and EMMA – Espoo Museum of Modern Art. Her video works have been shown at numerous film and media-art festivals in Europe. Her film Today We Live won first prize in the Helsinki Short Film Festival in 2013. Since graduating from the Finnish Academy of Fine Arts in 2007, Rauha Mäkilä’s (b. 1980, Helsinki) works have appeared in numerous solo and collective exhibitions in Finland and abroad, including: the Munch Gallery, New York, 2011; Kemper Museum of Contemporary Art, Kansas City, USA, 2015; and EMMA – Espoo Museum of Modern Art, Espoo, Finland, 2015. Her works are included in major collections in Finland, e.g. the Saastamoinen Foundation, Wihuri Foundation, and Museum of Contemporary Art Kiasma. Mäkilä’s latest exhibition at Helsinki Contemporary, Harmony, was in September 2015. Mäkilä was head of the jury for the Young Artists 2015 exhibition at Kunsthalle Helsinki. Mäkilä participated in the group exhibition Sensual Knowledge in Landskrona Museum in 2017. Camilla Vuorenmaa (b.1979, Tampere) has just been nominated as a candidate for year 2017 Ars Fennica Art Award. In the year 2015 she won the Fine Arts Academy of Finland Award and year 2013 International Solo Award in the juried open call show Spring Exhibition at Kunsthal Charlottenborg, Copenhagen, Denmark. Both prizes included solo exhibitions on following years at EMMA-Espoo modern Art museum, Espoo, Finland (2016) and at Kunsthal Charlottenburg, Copenhagen, Denmark (2014). Her latest solo exhibition was in January 2017 at Gallery Forum Box in Helsinki Finland. Her works has been seen before also for example at Jyväskylä Art Museum, Graphica Creativa, Jyväskylä, Finland (2016) and Bury Art Museum & Sculpture Centre, New Narrative And The Reader (2015) in England and Amos Andersons Art museum, Shift in the Shadows, Helsinki, Finland (2015), and in Gallery C4 projects, Copenhagen, Denmark (2014).